Raphael Styx is one of the most unusual police detectives around. Once he becomes a zombie, his hellish last name fits him better, even though it makes the detecting more difficult. As a blood-coursing human, he was a poor excuse for a man: a gambler, an adulterer, a cop on the take. As a zombie, he has a noble goal and higher purpose: to catch the serial killer who murdered him before he kills again. Styx’s poignant journey also becomes a way to help him admit what an awful person he had been to his colleagues and family. “The Stuffer” is so called because he eviscerates his victims and plumps up the bodies with sand or some other substance. He then poses his victims artistically — after all he is from Ostend, an area that has served as inspiration for generations of artists. Styx is one of the detectives assigned to find the killer, but he has made little headway during the six months he has had the case. Just his bad luck to catch the killer, only to be killed himself — initially — by the killer. 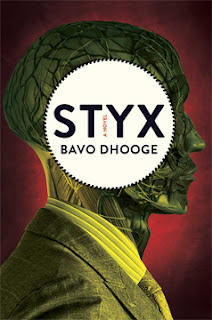 Although the resolution of “Styx” is based on pure, dumb luck rather than stellar detecting, it was hard not to be captivated by Styx’s thought processes and Dhooge’s ability to paint a vivid picture of a dead man walking — and dropping putrescent bits of himself along the way. Despite the grotesqueries, there is an inspirational quality to Styx’s newly discovered humility and desire for redemption. 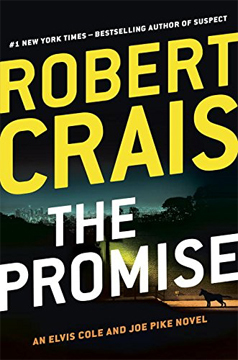 In 1987, Robert Crais entered the mystery field with “The Monkey’s Raincoat,” a marvelous book that introduced us to Los Angeles private investigator Elvis Cole. After fifteen books Elvis has his fan club. His sidekick, Joe Pike, may have had his own book or two along the way, but this series is Elvis’ show. K-9 cop Scott James may have had a book of his own (“The Suspect”), but Elvis is the top dog. Here, in “The Promise,” the world is righted once again with cool, tough guy Pike and nice, emotionally vulnerable James playing second fiddles. What distinguishes Elvis is his humor with attitude and equanimity without attitude. Also, Elvis is stylish. After all, he has a Pinocchio clock on his wall. He is the world’s greatest detective. How do we know that? Because Elvis says he is. All the time. He is astute and a good judge of character. When his newest client, Meryl Lawrence, hires him to find a co-worker, he suspects something is not quite on the up-and-up, especially when a dead body turns up. Throw in explosives manufacturing and terrorist cells, and Elvis has a lot to figure out. It additionally complicates his life when the police peg him as a prime suspect in the murder of a man Elvis stumbles across while looking for his client’s co-worker. In the process he is almost killed by a police officer. Fortunately, that officer was Scott James, an ex-soldier who is smart enough not to overreact. He and Maggie, his German Shepherd partner, begin a strange and surreptitious relationship with Elvis to find out who really killed the man. It becomes especially vital when the killer next targets James, the only person who saw his face. 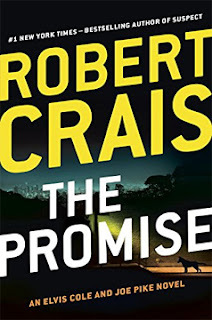 “The Promise” is a mishmash of first-person and third-person narration. Elvis, Pike, and James are joined by Jon Stone, an intermittent member of Elvis’ team. This gives us a bunch of points of view, including Maggie’s doggy perspective. The best parts are, of course, Elvis’ first-person storytelling. It is a little messy to have to juggle such different voices, but Crais has put together a great story. His twists are clever and the resolution quite unexpectedly moving. French author Patrick Modiano won the Nobel Prize for Literature in 2014. Would I have read this author if he had not won the award? Well, no, because his books were hard to find in an English translation prior to receiving the Nobel, and I didn’t even know who he was. Some of his books are hyped as atmospheric mysteries. Hmmm. Big yes for atmosphere. Little yes for mystery. I recently mentioned that one of the reasons I like mysteries is because the villain gets his/her just desserts in the end. Modiano deals in ambiguity, and that is what I had at the end. “So You Don’t Get Lost in the Neighborhood” tells a story of a crime in brief pieces, moving back and forth in time. And, were I to read it a second time, I would then (hopefully) have the whole story. Modiano does not pile-drive home his plot points, such as they are. He does have a recurring theme that comprises the bulk of “Neighborhood,” however, and it is the nebulous state of memory. Aging author Jean Daragane lives alone. It appears he does most things alone. When you have been too long on your own — he had not spoken to anyone since the beginning of the summer — you become suspicious and touchy towards your fellow men and you risk assessing them incorrectly. The mysterious Gilles Ottolini telephones Daragane (in a voice “dreary and threatening”) one day. He has found Daragane’s address book and wants to return it. Has Daragane been alone too long? Has he created Ottolini and his equally mysterious companion, Chantal Grippay, just to have company? Ottolini wants to know about a name in Daragane’s address book, but Daragane doesn’t recognize it. Who is Guy Torstel? Ottolini reminds Daragane that Torstel’s name appears in his first book. Not only does Daragane not remember Torstel, he only vaguely remembers his first book. There are repressed childhood memories that Daragane struggles alternately to let rise up and to bury further down. They may have to do with the murder of a young woman in 1951 who may have known another young woman who may have been his caregiver (or kidnapper?). Perhaps Ottolini and Grippay are imaginary contrivances his subconscious mind is using to bring those memories into the light of day. [H]e saw this period of his life through a frosted window. It allowed a vague clarity to filter through, but you could not make out the faces or even the figures. A glazed window, a sort of protective screen. Perhaps, thanks to deliberate forgetfulness, he had managed to protect himself from this past for good. But no sooner had he started his reading than he experienced an unpleasant sensation: the sentences became muddled and other sentences suddenly appeared that overlaid the previous ones and disappeared without giving him time to decipher them. He was confronted with a palimpsest in which all the various writings were jumbled together and superimposed, and moved about like bacilli seen through a microscope. If you read Modiano with the hope of a cracking detective story, put that hope aside. 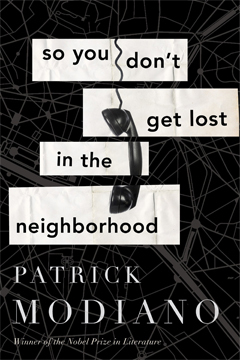 “Neighborhood” is a deeply moving psychological riddle with a purposely muddled punchline. Its dark, noirish atmosphere will wrap you in a soft, foggy cocoon. Perhaps you will like it, perhaps not. Perhaps you won’t remember it at all. All of us at Murder by the Book at one time or another answered the question, "Why do you like/read mysteries?" Most of us primarily read fictional crime stories. In fiction, an author can create motivation, puzzles, and an ending in which the culprit is named and usually made to pay for his or her crime. The fictional murders, assaults, and violence run the gamut from gently abraded (Agatha Christie) to viciously masticated ("Silence of the Lambs"). None of us ever mistook fiction for fact, nor did any of us desire to ever find even the coziest of crimes on our doorstep. It is appalling to think that Umpqua Community College in Roseburg -- a three-hour drive south of Portland -- is the latest (and probably not the last) setting for someone to arm himself to the teeth and willfully murder strangers as part of a sick fantasy. For one week every summer for fifteen years, I've driven from Portland to Roseburg to volunteer at Camp Millennium, a primarily Douglas County-supported charity that provides summer camp for children dealing with cancer. For several years, students at UCC have provided an afternoon of entertainment for the campers on their beautiful campus. How dare someone take the serenity and beauty of that campus away from everyone for even one second! To my Camp family from Roseburg, I wish it hadn't happened to your community. The murderer crossed the line. He put thought into action. To those of us who are avid mystery/thriller/suspense readers, that would be the furthest thing from our minds. 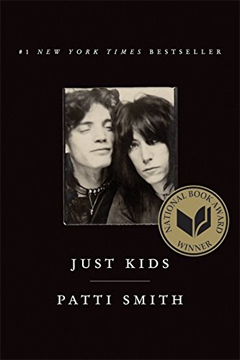 Before heading back into the mystery world, I read "Just Kids," the memoir that won poet/singer/artist Patti Smith the National Book Award a few years ago. I put on "Horses," "Easter," and "Dream of Life" while I read. Her new memoir, "M Train," has just been released, with good reviews in its wake. "Just Kids" is a powerful, sincere, poetic, touching, and slyly humorous book, mostly about her relationship with controversial artist/photographer Robert Mapplethorpe. The backdrop to their years together was the underground/beat/folk/hippie/punk scene in New York City in the 1960s and 70s. Smith is still exerting her influence on the music scene today. It was an exhilarating experience to view her life secondhand.